Falcon VII’s main goal was to score, score, score. We accomplished this by having a fast 6 wheel drive train with Omni-wheels in the front and back. This allowed us great maneuverability around the large field. We also had an arm that extended 10 feet up and allowed our gripper to place tetras on all of the goals. 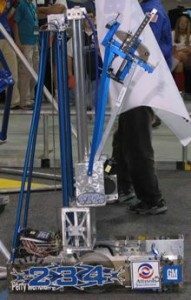 The strongest point of our 2005 robot was our gripper. Whenever we latched onto a tetra, we didn’t drop it. Once again it was our gripper. Most teams were grabbing the tetras from the top, whereas we picked it up from the bottom. Our gripper consisted of two small arms that would be inserted inside the tetra and then opened to clamp down on the sides of the tetra. This allowed us more control and stability which led to us scoring more points.